Signed l.l.corner, [incised plate] "C.Meryon...". Dated l.r.corner, [incised plate] "1852". The catalogue raisonné of the prints of Charles Meryon , London, 1990, 52, 53 (illus. ), 54 (illus. ), 55 (illus.). cat.no. 26. Illustration on pg. 53 is the third state, illustration on pg. 54 is the fourth (inscribed) & the sixth states, illustrations on pg. 55 are the eighth and tenth states. 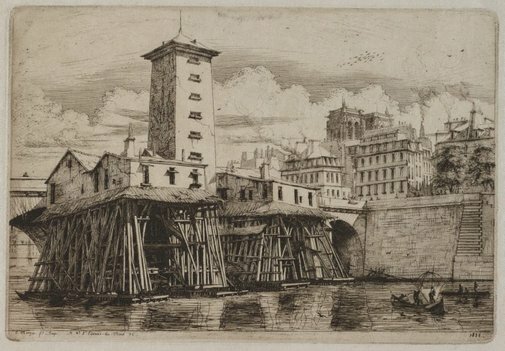 The bitten image: European etchings from the collection , Sydney, 1980, 11.